You’ve seen all those super creative and fun photo-a-day challenges – here, here, and here – well now it’s time for the super creative and fun nonprofit communications pros to take your smartphone camera and share your world. This challenge is for nonprofit folks who touch communications in some way – be it full-time, part-time, REALLY part-time or volunteer-time. We want to see your world. It can be from your personal account or from your organization’s account. It doesn’t matter, just snap away. Kivi of the Nonprofit Marketing Guide and the BC/DC Ideas crew love to see how nonprofit professionals make it happen every day. How you bring your mission to life through the people, technology and tools you interact with every day. So, we created this month-long challenge to give us all a peek. We’ll be hosting quarterly challenges, if this is successful, so take lots of pics! Below is the list of challenges for each day. Please feel free to take and share this image on your own Instagram, Twitter, blogs, and any other social media. We’ll be posting the photo prompt on @BCDCIdeas and @KiviLM each day to keep you inspired (and so you can remember – we’re all crazy busy and it’s easy to forget). We’ll start snapping on October 1, and play through October 31. 1. Share the image below on your Instagram feed if you haven’t already. Get your colleagues playing – feel free to share it on FB to your Page… and on Pinterest or Twitter, too! More the merrier!! 2. Follow @BCDCIdeas and @KiviLM on Instagram. We’ll be posting each day’s prompt to the feed to remind you to take your photo! 3. Post your response to each day’s prompt on your Instagram feed. 4. Make SURE to tag every challenge image #NPCommPix – We’ll be reposting our favorites throughout the month. How do I participate? Super easy. Look at the prompt for the day. If it’s the 5th day of the month, look at prompt 5. Take a picture that is somehow related to the prompt. It can be literal or not. We love metaphors and funny interpretations too! Whatever comes to mind for you is the right picture to take. 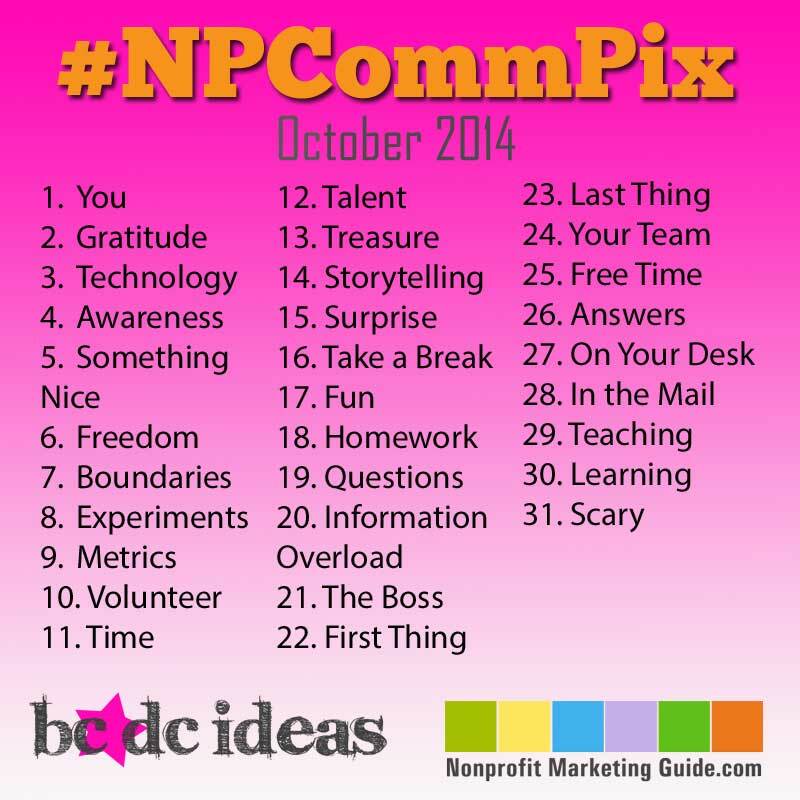 Post it to your favorite social media networks with the hashtag #npcommpix. That’s it! Of course, we also recommend that you use the hashtag to see what others are posting too, and to like/favorite/comment the ones you like best, but that’s entirely up to you. Do I need to sign up? Nope. Just start using the hashtag #npcommpix when you post your photo to Instagram or Twitter or any other place you are playing. Where do I post? We recommend Instagram and Twitter, but you can play anywhere. If you spend a lot of time on Pinterest or Flickr or your own blog, post there too. You can also post to the Nonprofit Marketing Guide Facebook page if you want: fb.com/nonprofitmarketingguide Just be sure to use the hashtag #npcommpix wherever you post. What if I miss some days? Play when you can! This is supposed to be fun, not a burden. Catch up if you want, or just skip the days you missed. Entirely up to you. What do you mean by . . . .? Nice try, but we aren’t going to interpret the prompts for you! Photograph whatever comes to mind or whatever seems right at the time. Who is behind this? Kivi Leroux Miller of NonprofitMarketingGuide.com and Dawn Crawford of BC/DC Ideas. Why are you doing this? We love our jobs, and want nonprofit communicators to love their jobs too. That means finding the fun in the work, and we hope this challenge is a quick, easy way to do that. Are you going to do it again next month? We probably won’t do it every month, but we hope to do it several times a year.